1. Go out the ticket gate and turn right (towards the north exit). 2. Go down the escalator and turn left. 3. Cross the small intersection, and follow the pedestrian-only shopping road that cuts diagonally through the city for about 7 minutes. 4. The shopping road will end at a major street (Rt. 20). To the left is a large intersection with a Seven Eleven on the corner. Cross the street and turn left to continue straight. 5. In about 1-2 minutes you will see Hachioji View Tower on your right. It is the tall building with the big glass entrance. 6. Enter View Tower and take the elevator in the hallway on your left. 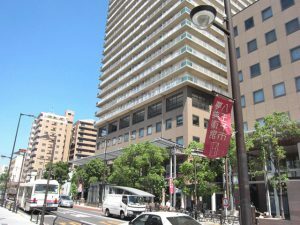 P-One Clinic is on the 4th floor above the Yume Art Museum. 1. Take the West exit. 2. Go up the escalator and turn left. 3. Turn left at the next main road (Rt. 20). 4. Go straight about 10-15 minutes until you reach an intersection with a Seven Eleven on the left hand side of the road and a Lawson’s directly across from it on the right hand side. 5. Continue going straight for about 2 minutes past the intersection. You will see Hachioji View Tower on your right. It is the tall building with the big glass entrance.